Launceston County Gaol | Launceston Then! “On the ground floor was a range of five cells, 9 x 8 and a kitchen, about 20 feet square, was situated in the left wing on the southern side. The court was about 30 feet wide, and the length of the kitchen and cells, with 4 feet to the entrance to the yard. From the Castle Dyke to the gaol was North East. The entrance from the Governor’s apartments was about 9 feet wide, over a stone staircase of 16 steps, where the bell-rope was fixed to time meals, and prisoners to go to rest. On the left hand side was the men’s cells, but the condemned cells (4 in all) were on the right hand side under the women’s apartments, large iron rings being fixed in the floors for the purpose of chaining criminals to. In the female’s apartments above were also 4 cells. The women’s yard was about 40 x 20. There were frequently at the time of a gaol delivery from 4 to 5 prisoners in a cell, and if the prison was ‘over crowded’, the Dark House was cleared for the accommodation of prisoners. John Mules was Governor until his death in 1803, and was succeeded by Christopher Mules, his son, who held it until 1826, when he died, and was followed in turn by his son, another Christopher Mules, who held the office until the abolition of the gaol as a place of detention in 1830, when he was transferred to Bodmin Gaol as a warder. 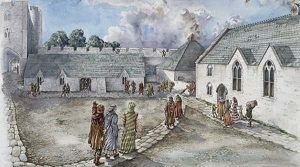 The gaol buildings were finally demolished about the year 1842, immediately after the wall had been built surrounding the Castle grounds, the widow of Christopher Mules, holding possession until the demolition. In the time of John Mules, the prisoners used to be taken to Launceston Church for spiritual consolation. The outer walls of the Gaol were about 22 feet in height. The old door now standing on the late Mr Ching’s property, at the entrance to Hendra, in the Western Road, formerly belonged to the Gaol, and was the door that led from the females’ wards, and through which all criminals passed who were tried at the assizes. Until recently there was another of the old gaol doors in Werrington Park, but that is now demolished. There was an entrance from Castle Dyke at the back of the present Wesleyan Chapel to the Gaol, commonly called ‘Stingnettle Lane’. Over the entrance to the Gaol was a signboard to the effect that there was ‘no admittance except by an order from the sheriff or a magistrate’”. This stone stood outside the old Town Hall/Assizes Court and is now situated outside the present Town Hall. Town Council meeting reported 21 January, 1928: OLD STONE TO BE PRESERVED. Extract from Peter’s ‘History of Launceston‘ 1895. “ In August, 1764, a Mr Leach surveyed and made a plan of Launceston Castle and Park. A copy of this plan has lately been presented by C.L. Cowlard, Esq., to the Scientific and Historical Society. It is a poor work of art, but is very interesting as a key to the old town as it appeared one hundred and twenty years ago. 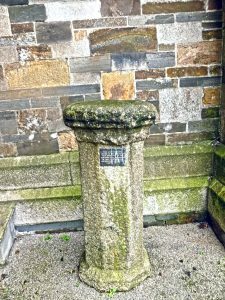 On it is marked the prison house to which we have referred; and the surveyor has also noted what he calls a remarkable stone, where ye Constable of ye Castle always delivers ye prisoners under sentence of death to ye Sheriff for execution. This stone was fixed in the road, which he names “a passage from the town to ye Castle”, but which we know as Castle Street, in front of the railings outside Mr. Dingley’s ‘Eagle House’, exactly on the line of the outer edge of the ancient ditch. 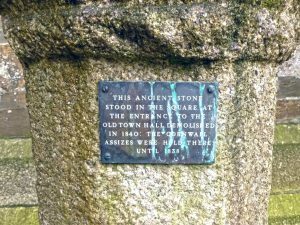 Tradition asserts that the piece of granite now at the end of the seat within the Castle Green, by the Doomsdale wall, is the historical stone mentioned by Mr. Leach”.